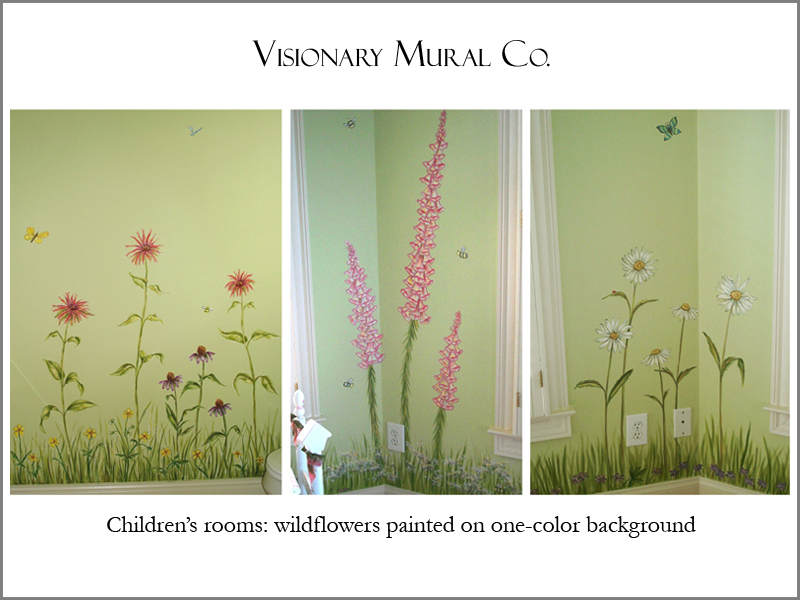 Create any mural or decorative motif to suit your tastes and child’s furnishings. Often a natural motif is a beautiful and gender-neutral way to create a room that will grow with your child. 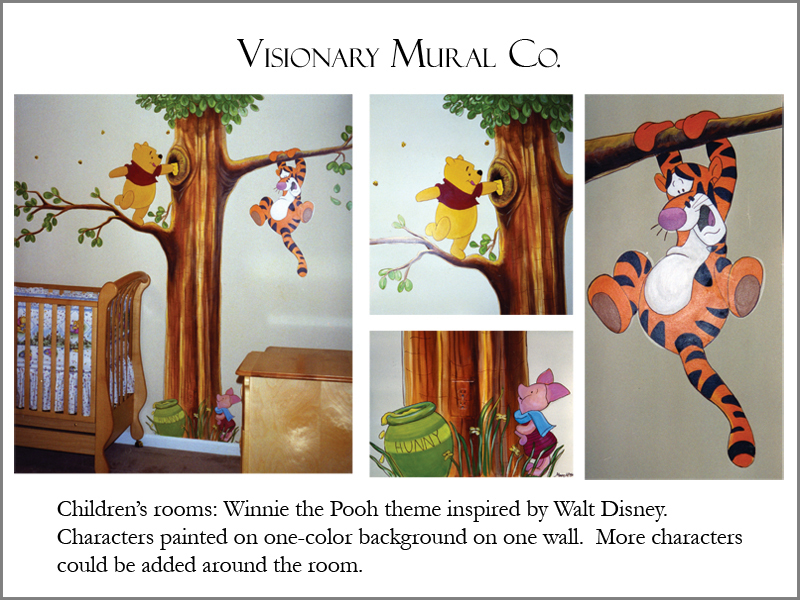 If you are trying to work within a budget, you can select a wall color that coordinates with the mural’s theme and paint images straight onto the wall without background as shown here in the wildflowers mural or the Disney-inspired Winnie the Pooh mural. 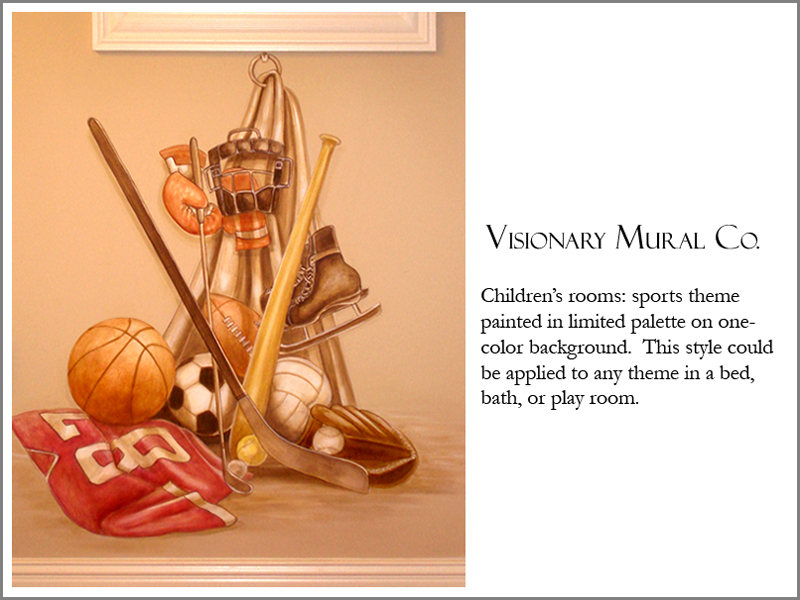 Or you can use a limited color palette like the Cinderella mural inspired by Graham Rust or the sports-themed mural. 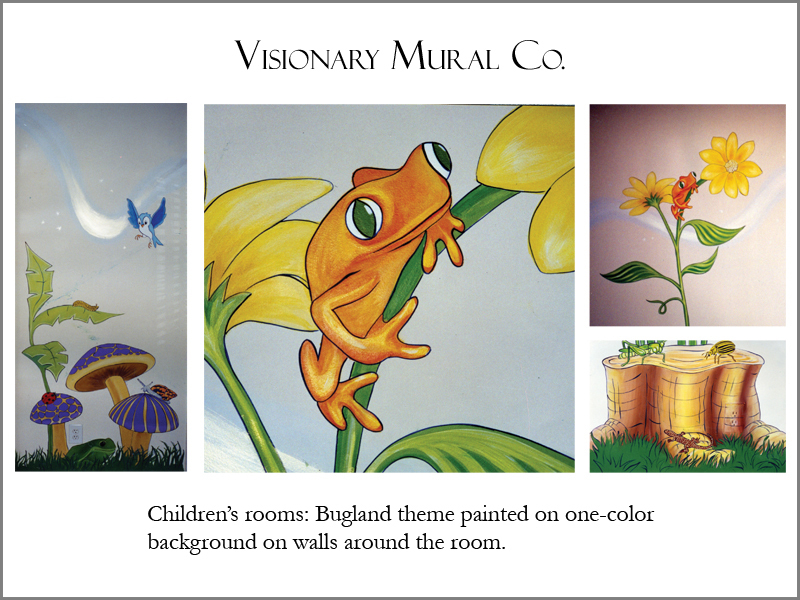 Murals that are monochromatic (one color) or of limited color palette can lend sophistication to a children’s themed project. 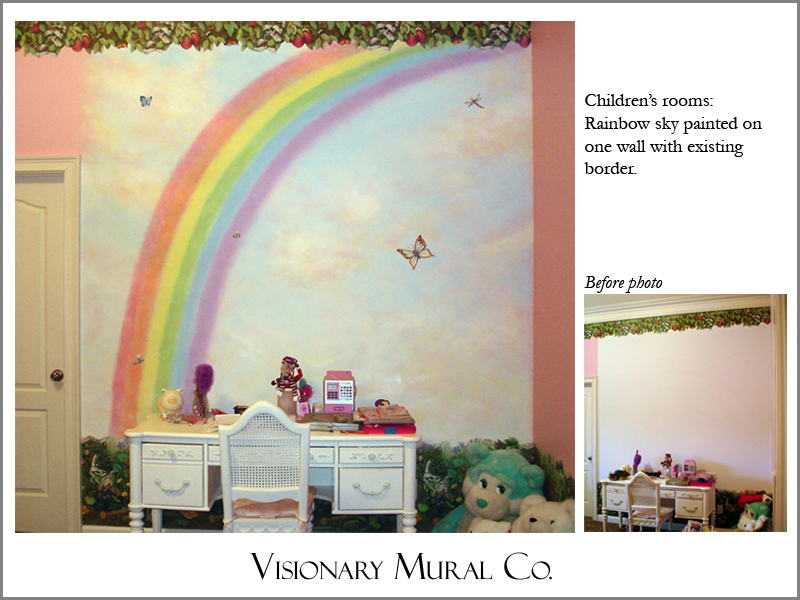 When thinking about your children’s mural, first look at the room you are interested in painting and determine which wall is the focal wall of the room. Find that by walking into the room and taking note of which wall or walls you naturally see first. 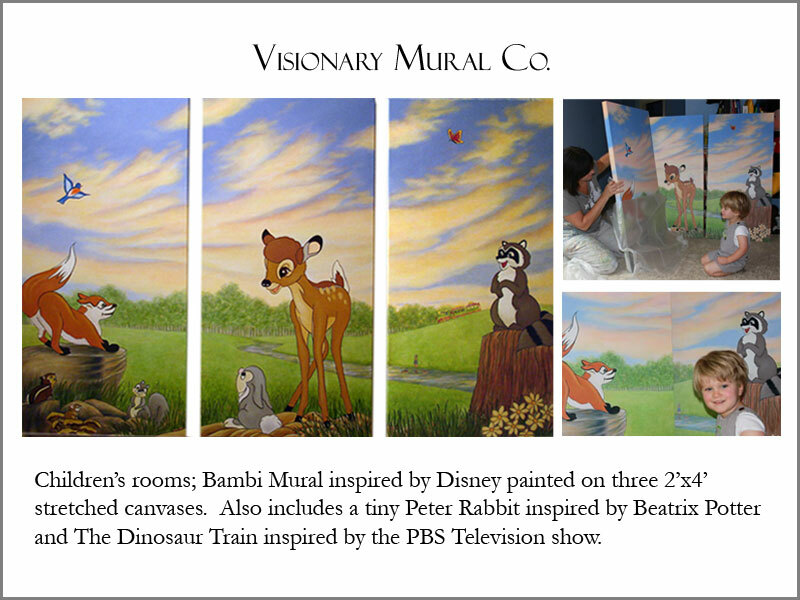 This can be the focal point of your mural, or where you can feature the most important elements of your mural design. 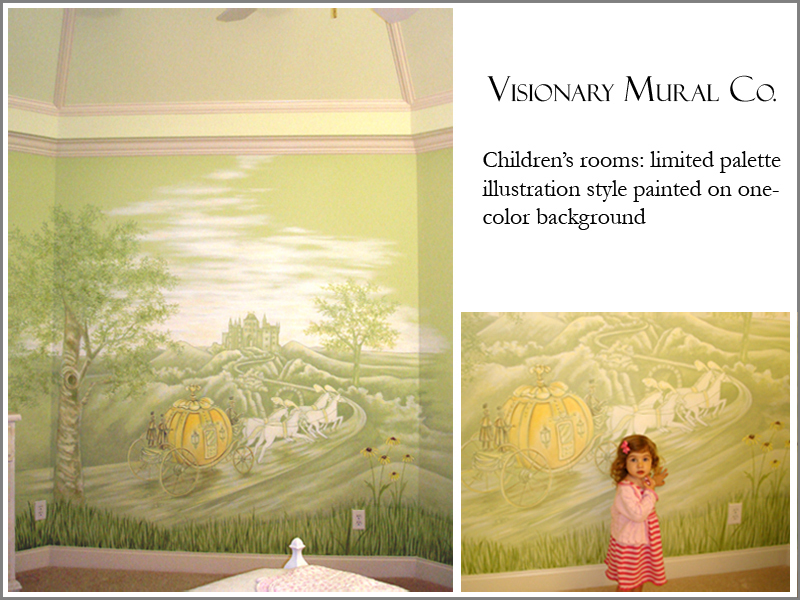 Often people want to paint the whole room with a mural, which is beautiful, but you also choose to paint only the focal wall or parts of the room if you are trying to work within a particular budget. Next, collect the measurements of the walls including ceiling height and any imagery of elements you like and might want to include in the mural design. Megan always has visual resources for your mural, but having pictures of elements or styles you like to start with is very helpful. Also, take pictures of the room and the furnishings you have, along with any fabrics you have or are planning. These will help determine the color palette of the mural and coordinate the entire design. Having these items ready will make planning your mural with Megan all the easier. 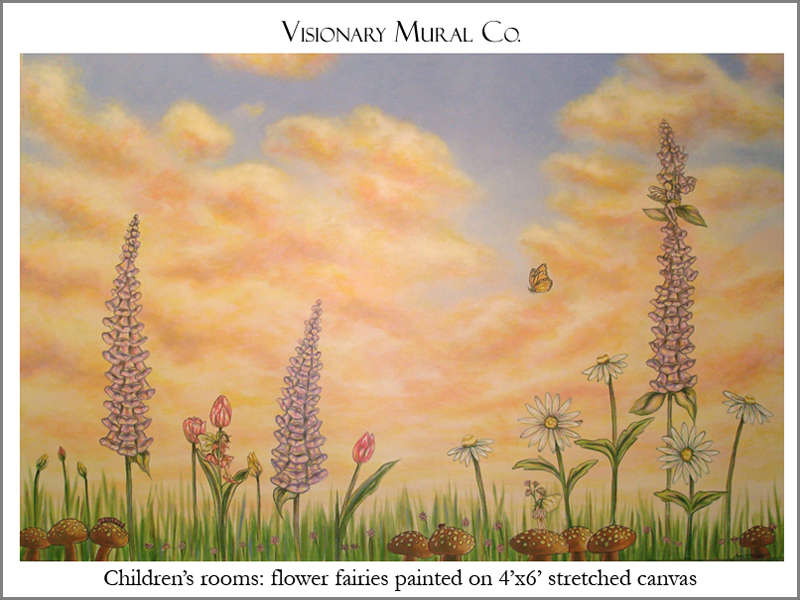 Megan paints much larger murals in a vast array of themes and styles, visit www.VisionaryMuralCo.com to see more of her portfolio and learn more about murals, trompe l’oeil illusions, and complete environments.